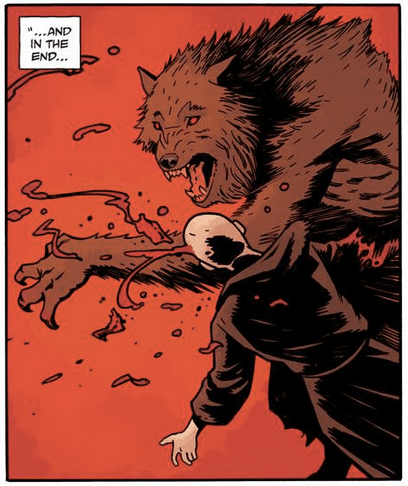 The end of 2014 and 2015 is shaping up to be a boon for Mignolaverse devotees. The Wolf and the Apostle, is another brilliant entry into the horror series, Baltimore. New to Baltimore? New to the horror comic genre? That’s OK – The Wolf and the Apostle is a good place to start for new readers. Werewolves, the Inquisition and making deals with the devil sound right up your alley? Follow me down the damp, blood-spattered cobblestone streets into the beginning of this new series. Since this story-arc is a two-parter, it’s very difficult to get into the meat of the story without spoiling any of the plot. However, this affords us the chance to discuss the tropes that make a good horror comic work, without delving into any long-winded “how-to-write-comics” diatribes. This is a useful look into the horror comic genre for people who have yet to stray from superhero or sci-fi titles. The reader will also get to meet the series’ namesake, Baltimore, a former British soldier that ran into an actual monster during the Great War — and suffered the consequences of being exposed to their existence (aka, having his entire family slaughtered). Baltimore got his revenge, but realized that a much darker power still needed to be destroyed. Now you’re all caught up (but really, you’d find a lot of worse ways to spend your time than going back and reading Baltimore from the beginning). Let’s set the stage. The Wolf and the Apostle is about a vicious werewolf terrorizing the denizens of an abandoned and darkly rendered castle, by ripping our their guts, in fictional post-World War I Europe. Europe’s population has been nearly obliterated by plague and falling to second or third on the food chain (vampires! yes!). In this two-parter, Judge Rigo, an Inquisitor judge, whom you get to meet for the very first time is struggling with the idea of hunting down a former Judge (now a werewolf). Rigo is faced with the idea of destroying something that is considered a monster, even though he might be capable of monstrous acts himself. Through Rigo’s interactions with Baltimore, you get the back-story of this timeline’s version of the Inquisition, Baltimore’s story, and learning about our protagonist’s motivations and fears. This gut-wrenching, fear-induced introspection is the perfect emotional tone to be paired with the visceral blood-and-guts-confetti visuals of the werewolf tearing his way through this abandoned castle keep. Why is this a good place to start getting into the horror genre? You’ve got all the classic staples of a good horror comic here. Beautiful, beautiful dark and moody art. Chunky disembowelments and terrifying monsters. Intestines, fangs and claws. Absolute fear and pain illustrated in a way that you don’t get to see outside of the horror genre. You have presented to you this idea of absolute good and evil, but that distinction is drawn into question by characters facing life, death and the supernatural. Stakes are just higher in horror comics. When people die. They stay dead. Or they rise up and kill other people. You know what I mean. Death. Death is one of the ultimate high stakes. And it will happen. And it will be brutal. That’s why you need to read Baltimore. 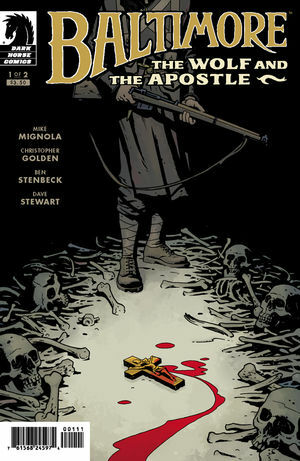 It is written by Mike Mignola, Christopher Golden and this two-parter is illustrated by Ben Stenbeck, his final work on the series. Yes, but with the caveat that this series is only the gateway to something more. In reality, this opens up your Shortbox to a different type of comic, a different type of story. Does The Wolf and The Apostle stand on its own? Yeah. 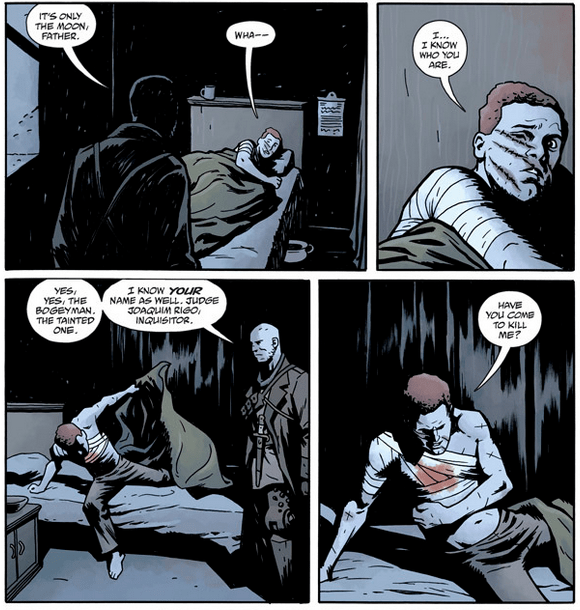 It’s a microcosm of what you can expect in the best of horror comics. It’s only two issues long… and you can pick it up on Amazon or in your local comic book shop. You can also get the digital issue HERE.